Virtual reality (VR) is a technology which enable users to interact with a computer-simulated environment. It is often used to offer visual experiences, and usually displayed on a screen. Virtual reality software we are talking about is such an application that can create virtual experience on the computer screen based on real world environment. The virtual tours created by Easypano virtual reality software are based on photos of real world or 3D modeling environment. Easypano virtual reality software - Tourweaver can build immersive virtual reality tours, which include 360 degree panoramic photos, standard digital photos, with interactive components like maps, hotspots, radars, links, dynamic text and popup windows. What is the advantage of virtual reality tour? What virtual reality software can I use to make virtual reality tours? EPublisher: Single panorama virtual reality tour publishing software. 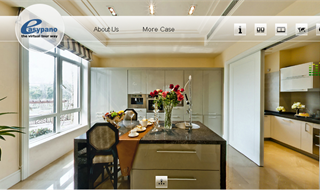 This software allows batch publishing 300 panoramas to full screen Flash and HTML5 virtual tours. Spherical panoramas and cylindrical panoramas are supported. Tourweaver: Virtual reality tour building software based on multiple panoramas. This software allows creating of virtual reality tours with multiple panoramas & still images, floorplans & maps, hotspots and many other interactive components. It is the most professional virtual reality software in the marketplace.